Art Advocado: Art Education Advocacy Blog: Art Advocado's Second Annual Back-to-School Art Teacher News Roundup! Art Advocado's Second Annual Back-to-School Art Teacher News Roundup! 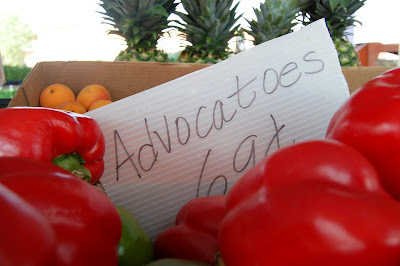 When shopping at your farmer's market this summer, did you come across any advocatoes? Jennifer of Oklahomans for the Arts did, and she submitted this picture as proof. Thanks for reading and submitting, Jennifer! Hello advocados (advocatoes?)! I'm back from my summer sabbatical from the blog. I hope you got exactly what you wanted out of your summer vacations, whether that was relaxation or productivity (or a combination of both). It can be both exciting and challenging to get back into the swing of things after the summer, whether you're a teacher who was off for the summer or an office denizen (like me) who just gets into the summer state of mind between Memorial Day and Labor Day. So let's kick of fall with some art teacher inspiration. Read on for my second-annual Back-to-School Art Teacher News Roundup (here's a link to the first one). With so much negative rhetoric floating around these days surrounding teachers, sometimes you might feel like you "can't get no respect" (apologies to Rodney Dangerfield). So it's thrilling to hear that a gallery in Vero Beach, FL is honoring the hard work of their art teachers. This August, watercolors by Scott Walker, art teacher Vero Beach High School, are on view at Lighthouse Art and Framing. "We wanted to honor art teachers for all that they do and felt like they needed to have an outlet, just like their students, but for their own artwork," said Tammy Torres of Lighthouse, who organized the show; she also said she hopes to show art by local art teachers every August. Hear hear to that! Awards galore! Spring, TX art teacher Grace Nguyen was honored with two prestigious awards this summer. The Kuehnle Elementary School art teacher was named Kuehnle Campus Teacher of the Year, and the Asian Chamber of Commerce's Educator of the Year. What's even more surprising is that Nguyen is new to the profession - she's only been teaching for three years, and this was the first year she was eligible for these awards. Impressive! But when you hear Nguyen's philosophy on teaching art, it's no surprise she is a successful art educator. “If [my students] feel like can accomplish something they’ve made a mistake on or they think they’ve made mistakes on, I always tell them you can solve this problem. I hope that through art, later in life they can solve their own problems and work everything out when they get older.” Congratulations Ms. Nguyen! As you know, I'm always on the hunt for inspiring and fun stories of art teachers around the country and beyond. I hope these pieces will give you some fuel going into the academic year (whether you're in school or not!) Remember you can always submit stories about an art teacher you know (even if it's yourself!) to be included here - leave a comment, email me at alisondwade (at) gmail (dot) com, or tweet at @DavisPub.